Sichuan Wontons + New Video! Today I'm excited to share with you a special video collaboration I recently did with Sydney from The Crepes of Wrath. Sydney and I met a few months ago at a BlogHer theater and networking event and since then, her blog has been one of my new favorites for regular reading, for both the photography and the writing. I've bookmarked so many of her recipes, including these beer braised ribs, miso kale salad, and chocolate chunk cookies. When she started posted short, fun cooking cooking videos, I became inspired to finally start making my own. So when Sydney asked if I wanted to do a cooking video together, as a way for food bloggers in New York to support and promote each others' work, I immediately said yes. Earlier this month, I spent a fun Sunday afternoon with her and her husband Kramer making (and eating!) Sichuan wontons, one of the dishes I regularly teach in my Dumplings and Wontons classes at West Elm Market and Brooklyn Brainery. 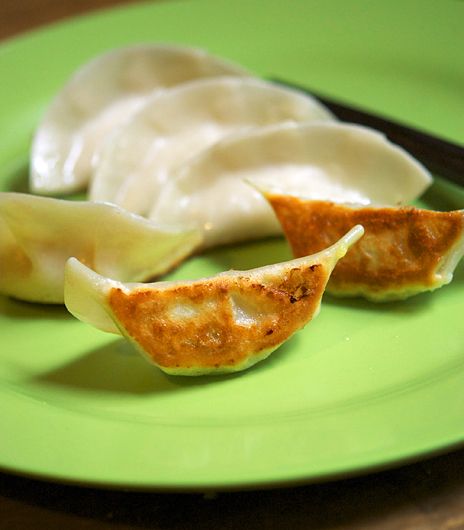 Check out the video below, then read on for more about Sichuan wontons! Thanksgiving kind of snuck up on us this year, didn't it? It seemed like only yesterday that we were carving pumpkins and planning Halloween costumes. Now it's time to prepare oneself for a massive turkey-centric feast. Earlier this week, to get into the Thanksgiving mood, I decided to make a big batch of turkey and mushroom dumplings. And when I make dumplings, I like to make a good number. I use up an entire back of 50-or-so dumpling wrappers and a pound of meat. While I wrap them, I put on a good podcast or catch up on a week's worth of The Daily Show, and kind of zone out. The whole process is all very Zen. While pork is often the default meat for Chinese dumplings, I find that turkey is a great option for somewhat lighter but still meaty dumplings. (They're also great if you're cooking for family or friends who don't eat pork.) I also throw in a healthy amount of chopped shiitake mushrooms, which has a great umami-ness that pairs well with the flavor of the turkey. It's ramp season in New York! Earlier yesterday, my neighborhood co-op tweeted that they just got a shipment of ramps in stock, which my friend Barb relayed to me via text. I was working on taxes at the time and wading through a mountain of receipts, so I was more than happy for an excuse to escape spreadsheets for a while and stroll (okay, powerwalk) to the store. Ramps, also known as wild leeks, are pretty much in season for about 3 weeks here, making them highly sought after by chefs and anyone crazy enough about food to follow farmers markets and co-ops on Twitter. They're grown only in the eastern part of the US and Canada, so the year I spent in San Francisco, land of copious farmers markets, was sadly ramp-free. The flavor of ramps is a like a combination of garlic and onion, with a mellow earthy flavor. You can use it in anything you would normally use onions, scallions, leeks, and garlic in, such as omelets, savory tarts, pasta dishes, and pizza. Today I decided to make dumplings with ramps and an especially pretty bunch of Swiss chard that was also in the store. Happy Chinese New Year! Over the weekend, I celebrated by guest chef-ing at Ted and Amy Supper Club in Brooklyn. We served a four-course meal for 14 people: shrimp and chive dumplings, watercress and mushroom noodle soup, red-cooked chicken with chestnuts, and for dessert, homemade black sesame ice cream with almond cookie crumble. Even I left in a food coma, and I had spent most of the day running around. It has been a while since I've featured a dumpling recipe on this site, so on Saturday afternoon, in the midst of preparing for the dinner, I pan-fried some extra dumplings for lunch and snapped a few photos. Ever gone apple-picking on a 90-degree day? Last weekend probably had the last of such summery temperatures until next June. But instead of lounging on the beach, I was at the apple orchard helping to pick about 30 pounds of crisp, earlyish-in-the-season apples. Signs of fall weren't completely missing: on the drive up the Hudson from New York, I spotted abut one in 30 trees with a vibrant red or orange hue. The cool weather on the radar for this week (and my insatiable craving for appley desserts) is probably a good sign that it had been the perfect time to go apple-picking. What does one end up doing with 30 pounds of apples? Apple bread, apple fritters, and apple cookies were all cranked out this weekend. In lieu of apple pie, we attempted apple pandowdy (which, I was reminded, is in the lyrics of an oldies hit.) For something savory, I decided to try apple dumplings.